New solar cells and therefore photovoltaic devices are quite expensive, since their primary material is silicon, which is expensive as a raw material, and also requires considerable costs in production. Therefore an approach of using polymers to create solar cells is a great advantage for both producers and consumers. However, several disadvantages are also present. These mainly are lower efficiency if compared with hard materials and also possibility of photochemical degradation. Different types of solar cells exist of polymer kind. These are: single layer organic photovoltaic cells, bilayer organic photovoltaic cells, bulk heterojunction photovoltaic cells and graded heterojunction photovoltaic cells. Single layer organic photovoltaic cells are simpliest forms of polymer solar cells. In this type of solar cells the layer of polymer is placed between two layers of metallic conductors (usually ITO – indium tin oxide). Typically this type of polymer solar cells is not the best option, as it has low quantum efficiencies and also low power conversion efficiency. Bilayer organic photovoltaic cells were created in order to deal with the problems arising with single layer organic photovoltaic cells. There are also two conductive metallic layers, however two organic (polymer) layers are placed instead of one, which will create strong electric fields between each other. Therefore these solar cells have higher light power conversion efficiency and quantum efficiency. Though in order to get such a result the thickness of layers was quite big, and therefore this type of polymer solar cells is not the best to use. To address that problem bulk heterojunction photovoltaic cells were developed. The structure may resemble bilayer organic photovoltaic cell, as there are again two organic layers, from which one takes on the role of electron donor and the other – electron acceptor. However, in bulk heterojunction photovoltaic solar cells these two layers are mixed together, in such a way forming polymer blend. In such a way the problem with size an thickness of solar cells doesn’t exist anymore. These celss are greatly efficient in comparison to the previous ones. Graded heterojunction solar cell are similar to bulk heterojunction photovoltaic cells, as in them the electron donor and receiver layers are also mixed. However, it is done in a special way, so that the gradient of those two layers is gradual. In such a way electrons have smaller distance to travel, and greater efficiency is preserved. In such a way it can be said that polymer solar cells are great innovative idea. This type of solar cells functions in its basics in the same way as other solar cells, meaning, that it converts the absorbed sunlight into electric power. However, what is greatly important, it is not much-less efficient alternative to existing expensive and far more complex silicon solar cell. 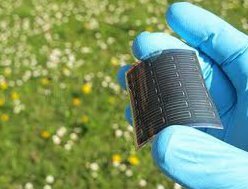 Polymer solar cells are also flexible (this is very convenient property for portable solar cells) and the costs for their production are around three times less than that of silicon cells’ production. And don’t forget that polymer solar cells are also easily disposable.